Gotham Steel Reviews 2019: The Best Ceramic Coated Pan? →Gotham Steel Pan Reviews: Best Ceramic Coated Pan? Looking for Gotham Steel Reviews to help you decide what brand of pan to get? Do you find yourself frustrated when cooking with pans? The pans are so difficult to cook with that many Americans are saying that their food always gets stuck. They end up spending more time scraping food off of their pans than they do preparing the food itself. Gotham Steel pans seek to solve this problem by offering non-stick pans. With these pans, your food should glide right off of the pan to your plate. You may be familiar with Gotham Steel after seeing commercials on TV. The company claims to have sold over a million pans. Last year, the company announced that they were the Official Cookware Partner of the 2017 World Food Championships. Knowing this, Gotham Steel pans almost sound too good to be true. And with all the Gotham Steel Reviews going on everywhere, let’s take a look to see if they’re worth the hype. What Are Gotham Steel Pans and How Do They Work? What Makes Gotham Steel Pans Unique? Although Green was already well-known, his popularity exploded thanks to Gotham Steel pans. The pans combine non-stick ceramic and titanium for a sturdy, non-stick pan. 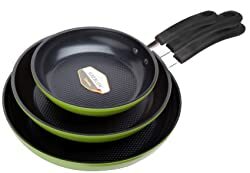 The company’s website says that you do not need to cook with oil, butter, or other types of greases as you would with a traditional pan; this is thanks to the company’s trademarked Ti-Cerama non-stick technology. The downside of many pans is their lack of durability. Many pans are not dishwasher safe. You must also be careful when using utensils on traditional pans, as you can easily scratch the pan’s surface. This is especially true with other non-stick pans. Utensils can ruin the non-stick coating on the pan. Not being able to use utensils can be frustrating, especially when you are trying to see that your food’s finished. With Gotham Steel pans, you no longer have this issue. The pans are safe for use with metal utensils, so you don’t have to worry about scratching the pan’s surface. Additionally, the pans are dishwasher safe, in addition to being safe for use in the oven up to 500 degrees. This is great if you’re looking to keep a dish warm or sear in juices by baking it in the oven for a few minutes longer. The pans are also free of PTFE, PFOA, and PFOS. PTFE is better known as Teflon and is widely-used in other non-stick pans. Even tough Teflon is not considered dangerous, but its byproduct which is PFOA is risking people’s health. PFOA is used in the process of making Teflon and can stay in the human body for long periods of time. Researchers have tested potential links between PFOA and cancer. PFOS is another chemical similar to PFOA. It has a half-life of up to nine years, and stores itself in the kidney and live. In 2016, the Environmental Protection Agency released a statement detailing how dangerous exposure to PFOA and PFOS can be. The chemicals can cause developmental effects during pregnancy, as well as liver effects, thyroid effects, and changes in cholesterol and the immune system. One of the unique dynamics of Gotham Steel pans is their Ti-Cerama Technology. This technology is what allows the pans to be non-stick without using harsh, potentially dangerous chemicals like PFOA and PFOS. The base of the pan consists of titanium, which is what makes it possible for the pan to go in the dishwasher and the oven. The coating of the pan is ceramic, providing a non-stick surface. The ceramic coating is a thin layer of clay that has been hardened by heat, and this means that the cooking surface is all-natural. Many find that ceramic requires less time to cure; this reduces the amount of time your food needs to cook, which can, in turn, save you energy. Ceramic-based products have been shown to emit 50% less carbon dioxide than products lined with Teflon. The cooking pan will cost an additional $10 in shipping for those having their order sent to either Alaska or Hawaii. It requires an extra $20 in shipping to have the pan shipped to Puerto Rico. Amazon also has multiple Gotham Steel offerings on their website. 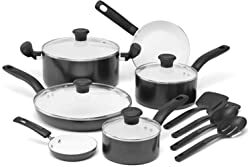 Amazon offers many bundle packs that can make it easier for you to purchase the pans you need in your kitchen. If you buy the product from a third-party like Amazon, you will have to go through them for all returns, exchanges, and refunds. Unfortunately, like all things in life, if it seems too good to be true, it probably is. While this product sounds like the perfect non-stick pan, reviews from previous Gotham Steel owners are not very favorable. For instance, Gotham Steel reviews are 1.5-stars on Consumer Reports, with 24 people reviewing the product. Of the listed Gotham Steel reviews, two of the 24 are five-star reviews, while 20 of the 24 are one-star reviews. Ironically, the only four-star review of the product says that you’ll need to add butter if you plan to cook eggs in the pan. However, remember that the company claimed you do not need oil or butter to cook any food in the pan. And, on their website and As Seen on TV infomercial, one of the first meals shown on the pan is eggs. In fact, there is a video of eggs swirling around the pan effortlessly. So, it appears based on this review alone; the pans may not be what they’re chalked up to be. The Gotham Steel reviews only get worse from there. It seems as though the pan works great for people for a month or two. At that point, the ceramic coating begins to wear off, and the pan becomes very sticky. These reviews come from people who followed product guidelines. Some even took care to wash the pans by hand, choosing not to stick them in the dishwasher. Even with reviewers having taken great care, the pans still eventually broke down. Most reported that after using the product for about a month, food began to stick in certain places. After using the pan for two months, they had to throw the pan away entirely. People found that they could not get the pan’s surface clean, no matter what they tried. False advertising seems to be one of the most significant trends in the Consumer Reports reviews. People reported that the pan was prone to scratching. Some even said that the pan warped after its third use. Pretty much everyone said that the pan did not operate as described in the infomercial. The Gotham Steel’s customer service is working very dissatisfactory that displeased the customers, saying they were rude over the phone. The pans were working poorly and it shocked the customers because they are without a warranty. Of those reviews, 43% were five-star reviews while 33% were one-star reviews. Most of the Gotham Steel reviews were similar to the studies found in Consumer Reports. Some users indicate that food began sticking to it within three uses. Furthermore, customers were very displeased with Gotham Steel’s customer service, saying that they were rude over the phone. Many reviewers were shocked to find out that their pan did not have a warranty, considering that it broke down so quickly. The pan works very poorly that many reviewers expressed sentiments of its worse quality. The pan’s commercial is showing deceit and flat-out lie. Even those who offered three-star reviews of the product said that it was a complete waste of money. Unfortunately, across the entire market, this line of products does not review favorably. One of the main alternatives to Gotham Steel pans is Copper Chef Non-stick pans. 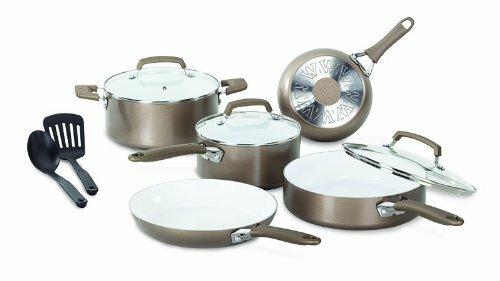 Copper Chef pans also claim to be non-stick pans that do not contain harsh chemicals. Similar to Gotham Steel pans, Copper Chef pans use a ceramic coating to achieve their non-stick properties. As a result, they also do not contain chemicals like Teflon or PFOA. The making of the pan is a combination of steel and aluminum. Copper Chef pans are more heat-resistant than Gotham City pans. Copper Chef pans are heat-resistant up to 850 degrees. However, reviews of Copper Chef pans are not great either. The product has a 1.8-star rating on Consumer Reports, although there are only nine reviews. Some users reported that the ceramic coating wore off within one use. At least one reviewer had to throw food away because the ceramic surface had gotten onto their food. Other reviewers indicated that food still stuck to the pan, even though they cooked in oil and butter. The reviews for Copper Chef pans were the same as Gotham Steel pans. Both pans did not work as expected. They only worked for about a month or two, after which you will be throwing them away in less than a year. If the pan lived up to its claims, it would be one of the best pans on the market. Unfortunately, this is not the case. The pan is giving an unsatisfactory outcome to the users hence, negative reviews about the pan that it cannot be trusted. We feel that it’s better to invest in a high-quality non-stick pan that will last for years, instead of wasting $25 every few months for a pan that is going to stop working after the first few times you use it. 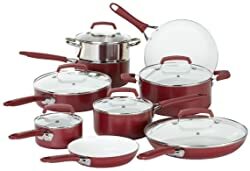 The desire to cook with a pan that does not contain harsh chemicals is reasonable and we understand your sentiments, but all ceramic pans seem to have the same problem that they become ineffective within a few months. For this reason, we recommend checking out a product like GreenLife. These pans feature a Thermolon coating, which is a safer alternative to Teflon. 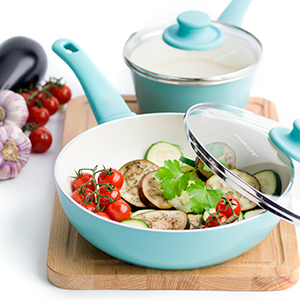 This ceramic nonstick coating has a higher heating point, which means it will not give off as much carbon dioxide when you are cooking. Thermolon will also hold up better against abrasives used to clean your pan, such as baking soda. GreenLife pans do not contain any lead, cadmium, PTFE, or PFOA. 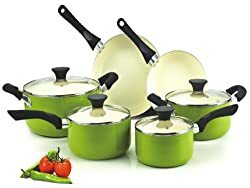 A GreenLife bundle with multiple pans available on Amazon with a near four-star review. Just like Gotham Steel pans, GreenLife pans are dishwasher safe. The pan features a body reinforced with aluminum, making it safe in the oven up to 350 degrees. You can also choose from multiple colors, including black, burgundy, and turquoise. This allows your pans to match your kitchen décor better. On a similar note, you may also check our review on another ceramic coated pan called Red Copper Square Pan. Gotham Steel’s website is currently offering a deal that allows you to add a second pan to your order for free. All you have to do is pay the additional $6.95 handling fee for the second pan. So, for $19.99 and $13.90 in handling and packaging, you will receive two Gotham Steel non-stick pans. Additionally, you may be able to find deals offered by third-party websites like Groupon.